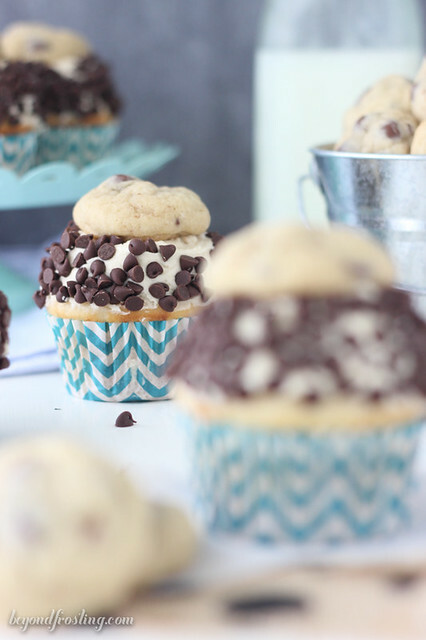 These are the Ultimate Cookie Dough Cupcakes! 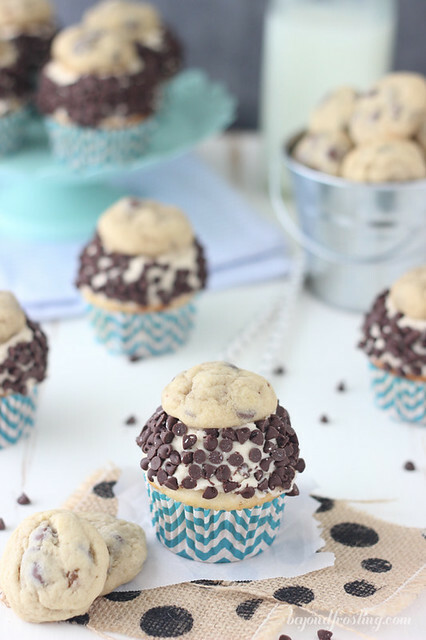 A vanilla malt cupcake with cookie dough frosting, rolled in chocolate chips and topped with a chocolate chip cookie! I just could not wait to share these cupcakes with you. I made them over the weekend and brought them into my office on Monday. I tortured my coworkers all day by making them wait until the late afternoon to eat them. I can’t even tell you the number of people that asked me, what they were, when we were eating them and how much longer did they have to wait. Needless to say, these went over VERY well. Let’s side bar for a minute. Did anyone watch the Bachelorette? Quick breakdown for ya. Night one was all “what the heck” and “who is this guys”. I mean REALLY. The healer? I just can’t. He needs to go. Plus that drunk Ryan guy, I am so glad they made the executive decision to kick him off. Lastly, I am totally on team Kaitlyn, so booyah! 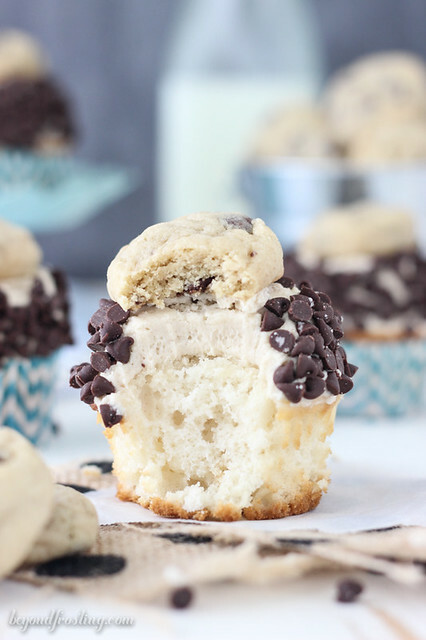 These Ultimate Cookie Dough Cupcakes are the only cupcakes you will ever need. 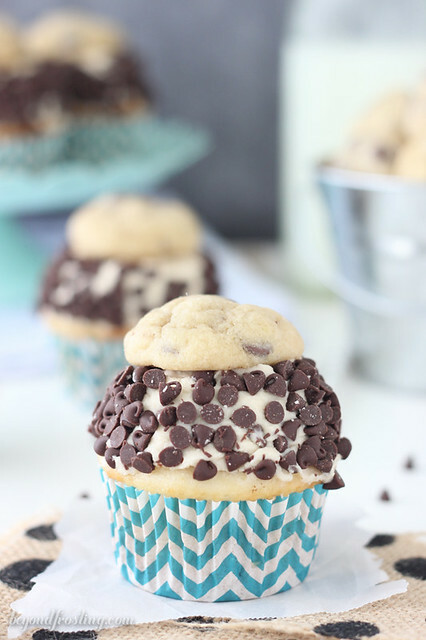 It is a vanilla malt cupcake with a cookie dough frosting that is topped with a two-bite chocolate chip cookie. These cupcakes are pure bliss. 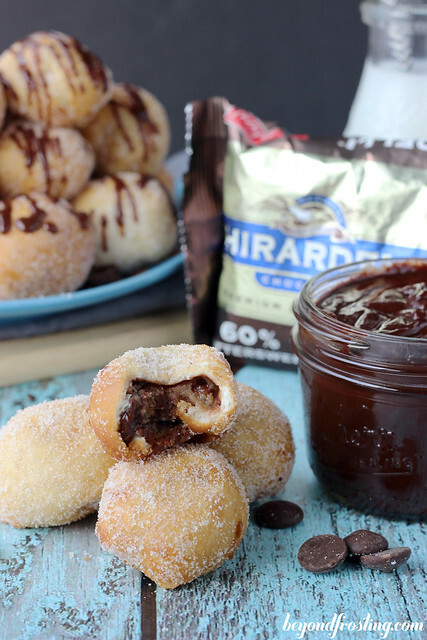 Every bite is incredible. After making this recipe, I decided that all cookies should be bite sized, then I can eat a handful and it’s still like eating only 2 or 3 cookies. That’s what I am going to tell myself anyway. For the cookies, I just made a batch of home made chocolate chip cookies and used a 1 inch cookie scoop to make the smaller cookies on top. My favorite recipe is from Picky Palate. 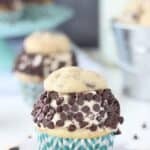 However, you don’t need to make cookies for these cupcakes, you can absolutely get some cookies at the store. I chose to make my own cookies so that I could freeze some leftover cookie dough which I ate during the bachelorette. Fresh cookies are over rated. Let’s pretend that I never said that, mmkay? I got a lot of questions about how I made the frosting taste like cookie dough. It’s quite simple really, you start with butter, like any frosting or cookie dough base. Then you add a little bit of brown sugar and some flour. Once that is well mixed, you just start to add powdered sugar and alternate in some milk and vanilla extract. I did add a pinch of salt to this frosting to help cut the sweetness. Just make sure you don’t add any eggs!! When I frosted these cupcakes, I built up a wall around the sides and then rolled them in mini chocolate chips. It is certainly was not the quickest technique, but I loved the way it came out. It left me plenty of room to top these cupcakes with my mini cookies. If you like a lot of frosting, this cupcake is for you! I threw together these cupcakes with a few simple ingredients. It starts with a white cake mix, some vanilla malt powder, egg whites, sour cream, vanilla extract, oil and milk. I love to use malt powder in my desserts. If you don’t have malt powder, you can easily substitute this for instant vanilla pudding mix. Lets break this down one more time. Vanilla malt cupcake topped with a cookie dough frosting, rolled in chocolate chips and topped with a mini chocolate chip cookie. Don’t miss a thing, subscribe at the end of this post! 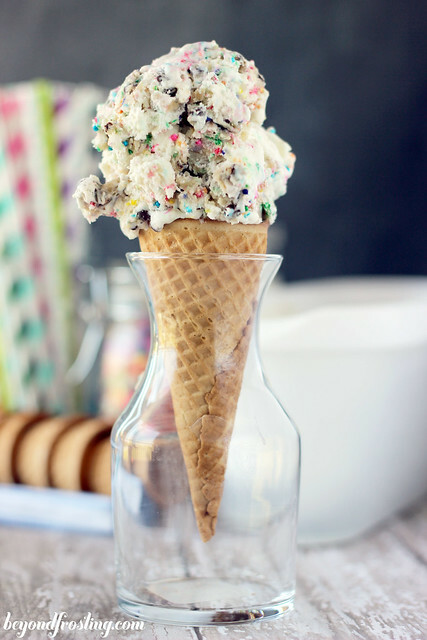 If you love cookie dough be sure to check out my cookie dough obsessed Pinterest board! Prepare chocolate chip cookies in advance, using a 1” cookie scoop. Or use store-bought cookies. My favorite chocolate chip cookie recipe is here. Pre-heat over to 350° F.
In a large mixing bowl, combine cake mix, malt powder, egg whites, milk, vegetable oil, sour cream, and vanilla extract. Beat on medium speed until all ingredients are well mixed. Scrape down the sides of the bowl and stir from the bottom. Divide batter evenly between lined cupcake pan. Bake at 350° for 14-16 minutes. Check for doneness by inserting a toothpick into the center of the cupcake. If the toothpick comes out clean, your cupcake is done. Cool completely. Beat butter in mixer on medium speed until smooth and creamy: 2-3 minutes. 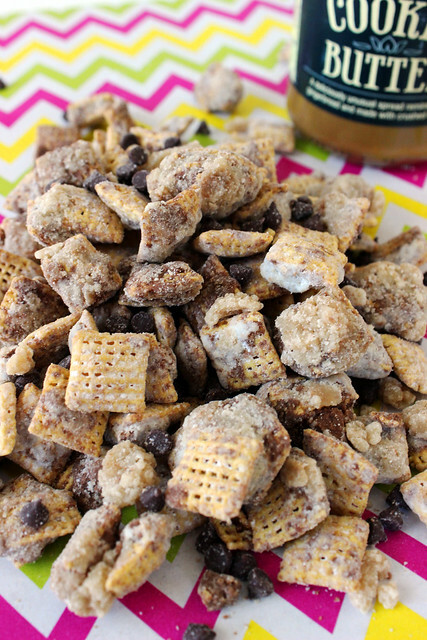 Add brown sugar and mix until combined. Continue to slowly add flour and vanilla extract and be sure it’s well mixed. Scrape down the sides of the bowl. Pour powdered sugar into mixing bowl 1 cup at a time, adding gradually while beating at a low speed. Alternate with milk. Once all powdered sugar and milk have been added, increase speed to medium high and whip for 2-3 minutes to incorporate air into the frosting. To frost the cupcakes, pile a scoop of frosting on top, use an angled spatula and flatten out the top slightly. Use your spatula to form a wall around the side of the frosting. 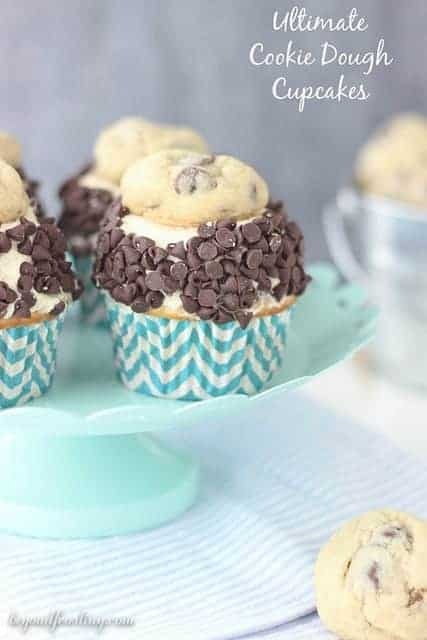 Pour mini chocolate chips onto a paper plate. 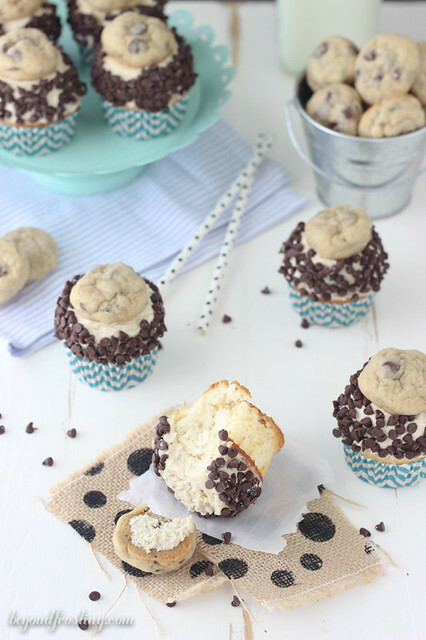 Roll the sides of the cupcake in the mini chocolate chips. 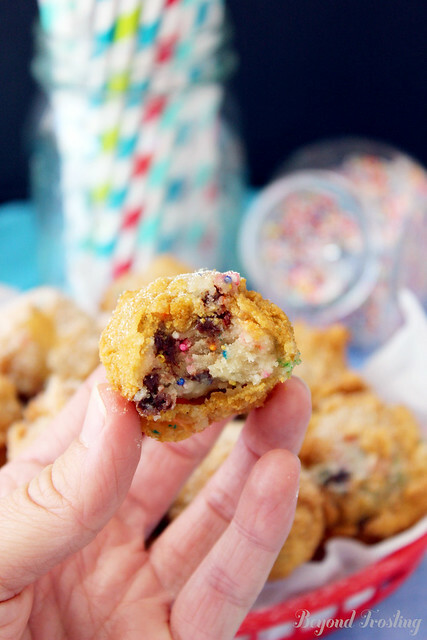 Top with chocolate chip cookie. Keep in an airtight container up to 2 days. Be sure to check out the helpful tools at the end of this post. Malted milk powder can be substituted with instant vanilla pudding. I’m wanting to try this recipe as a round cake instead of cupcakes. Have you made it as a cake and would it be 2 layers? Hi Nicky, I have note tried it as a cake but that sounds like a fabulous idea! The cake recipe will make 2 9″ layers or 2 8″ layers for sure. You might want to make a little extra frosting. I believe that every cupcake should look this good! 🙂 These little guys are absolute stunners! 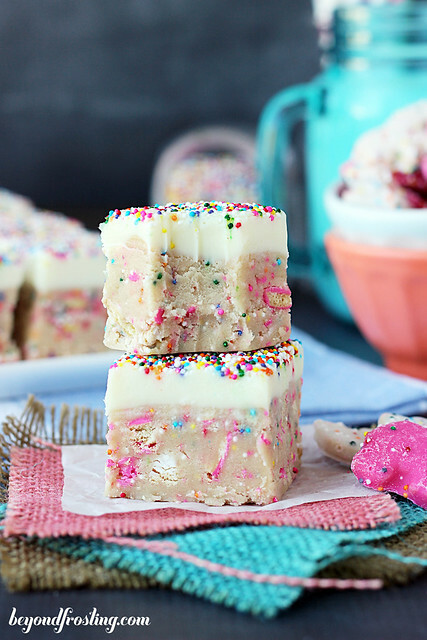 And, who doesn’t love cookie dough? These look to die for! I love them! And also, I’m finally caught up on the bach after my trip and it looks like it’s going to be one crazy season! YES!! I love that June!